There are plenty of reasons LinkedIn is an excellent tool for venues to use. First and foremost, LinkedIn is a free social media platform offering your venue huge marketing opportunities. There are over 575 million users on LinkedIn, with two new LinkedIn accounts being created every single second. That gives you access to a huge network of users for the low cost of, well, nothing. What makes LinkedIn such a great choice for venues? As you well know, LinkedIn is a social media platform for professionals. According to Bizzabo 28% of companies allocate 20% of their marketing budget to their corporate event calendar. Bizzabo also report that 21% of event planners hold the purse strings, or at least influence the person with the purse strings, to an events budget of over $1 million. In our experience, event bookings from businesses carry a considerably higher price tag than B2C event bookings. With LinkedIn, you can market your venue to event bookers in companies with cash to spend. The best thing about corporate event bookings at your venue? Corporate bookers are much more likely to book again and again. With event calendars full with meetings, private dining, networking, conferences, parties, and panels, your venue is likely to benefit from significantly added revenue streams by marketing on LinkedIn. How Can Venues Optimise Their Company Page? If you don’t already have a Company Page set up for your venue, your first step is to create one. This is your ‘shop window’; it should be as informative as possible, appealing to a broad audience. There are a few crucial things you need to do immediately. Build brand recognition. Your profile picture should be your company logo, rather than a photo of your venue. Add a Background Image. This should be a professional photo of your venue in all its glory. For a professional look, consider choosing an area in your venue that is attractive, clean and uncluttered. Add your Tagline. This is one sentence underneath your Profile Picture which should sum up your mission or purpose. Add your Company Description. This should help visitors understand your venue and what you offer in a more descriptive way. Here you can elaborate more on the types of events you host and the benefits of booking events at your venue. Complete your About section. This includes your website, phone number, industry, company size, company type and location. Add a Website Link. LinkedIn offers a custom button under your Company Logo, where you can choose your own Call to Action. You can choose different text for this button depending on what you want to get from being on LinkedIn. If you want people to see your website, choose ‘Visit Website’ and link this button to your homepage. If you want people to get in touch with your Sales team, choose ‘Contact Us’ and link the button to your Contact page. 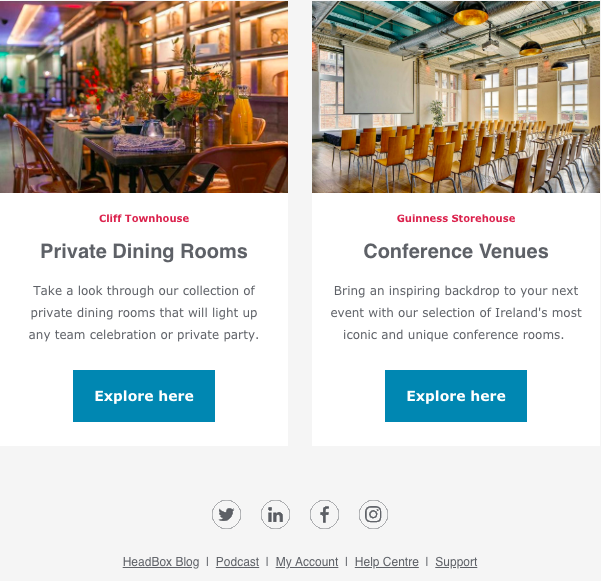 With your profile completed, visitors will have all the information they need to decide whether they’d like to visit your website to find out more or get in touch with your team to book your venue. 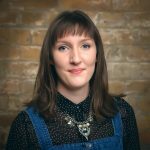 How Can Venues Build Their LinkedIn Audience? Once your company page is optimised you can focus on growing your audience of LinkedIn followers. There are a few easy ways to do this. Add your LinkedIn company page link in the footer of your emails. 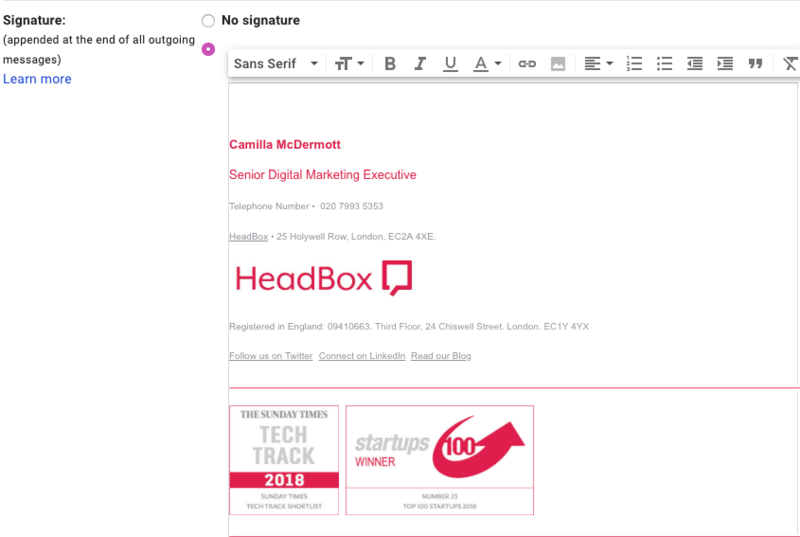 If you standardise this across your whole business, your LinkedIn company page will be put in front of everyone that you or your colleague’s email. That’s a lot of people. Promote your page on other social channels. If you already have a large following on Facebook or Twitter, you have some potential new LinkedIn followers already. Send a post about your LinkedIn page on another successful channel and watch your followers grow. Invite people to follow you. Working in the events industry, you undoubtedly spend a lot of time in meetings and on-site visits. These contacts might like to follow you on LinkedIn to stay abreast of your news and special offers. Make sure they know it’s worth their while. How Personal LinkedIn Accounts Can Complement Company Pages? Your own personal LinkedIn page is a piece of the puzzle that is often forgotten. Each and every employee at your venue could be contributing to the growth of your company’s LinkedIn following. 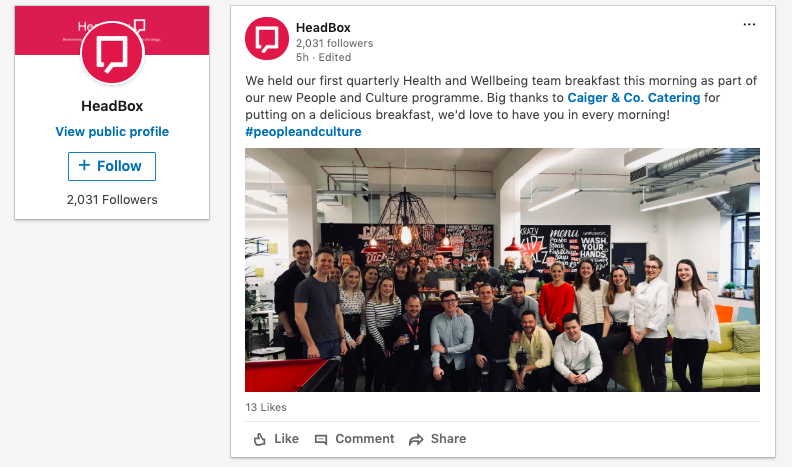 At HeadBox, we place enormous importance on employee engagement with our company’s LinkedIn content, and this has helped us to enjoy rapid growth. There are two ways your team can help you see the same success. Growing your own professional network. You and your team will be meeting new people every single day, growing your own network of followers. Since everything you like and share will appear in the feeds of all your own followers, engaging with your company’s content on LinkedIn increases its reach astronomically. If everyone in your company shares your company’s content, you could be extending your company’s reach by hundreds of thousands of impressions. Creating a LinkedIn page that aligns with your venue’s brand. 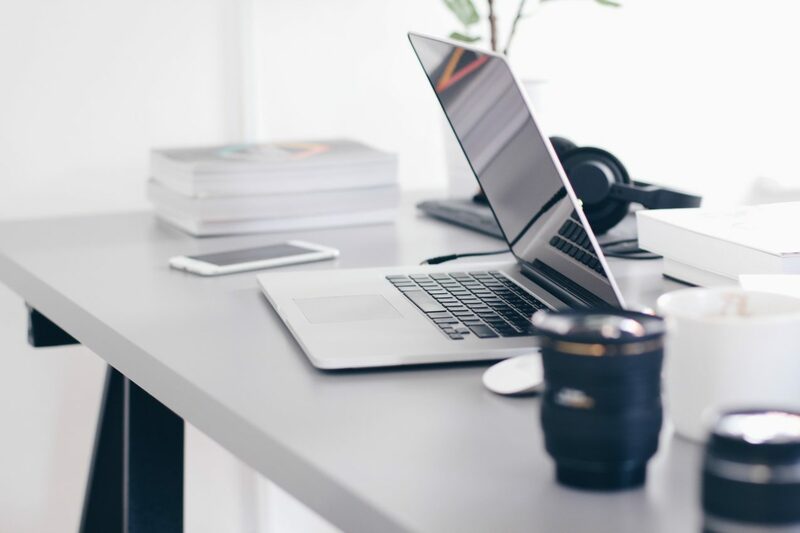 For many of your own connections who have not met you via your current role in your current company, your own LinkedIn page is a window into your company. We recommend standardised background images on all personal profiles, as well as standardised messaging about your venue. This increases brand recognition and creates a much slicker, more professional experience for people who have viewed your own profile. Engaging with your clients. Clients who have already booked your Space should have your venue at the front of their mind when they begin planning their next event. A quick and easy way to ensure this happens is to regularly engage with your clients’ content. Your team should keep an eye on what your clients are posting and like and share this content where appropriate, both from their own accounts and from the company account. Thought leadership content. As a venue, your team has their finger on the pulse of the latest developments in the events industry. Your valuable input in industry conversations could teach people something new, and show that you’re an expert in your field. It’s a win-win. We’d suggest that you regularly check up on which types of content are generating the most engagement and followers by using LinkedIn Analytics. By bucketing your content into groups such as those above, you can start to learn exactly what your audience wants to read about. Then, you can focus on creating more content they will actually read and enjoy, keeping your brand at the front of their mind next time they are planning an event. So, there are plenty of things you can be doing to maximise your presence on LinkedIn. 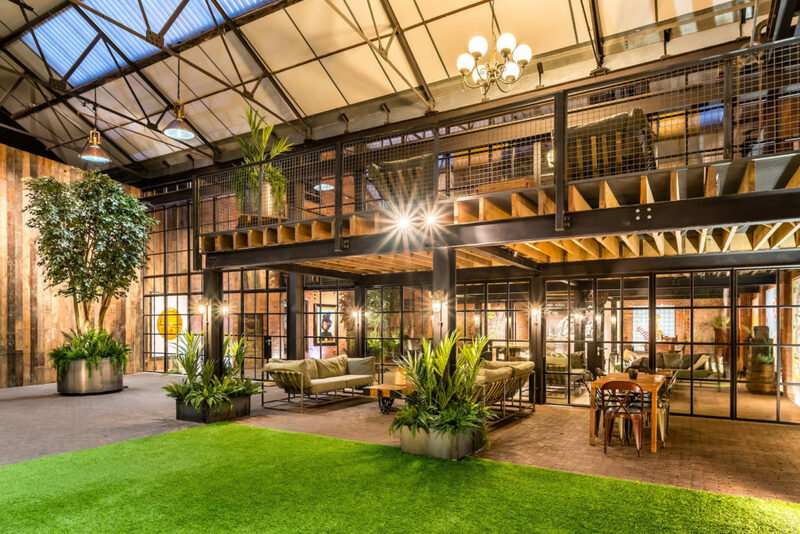 The potential opportunity for your venue is enormous, and it’s right there for the taking. What’s more, LinkedIn is a sorely neglected social platform when it comes to event venues. That means the landscape is less crowded, and it will be much easier to make your venue stand out. You can thank us later.